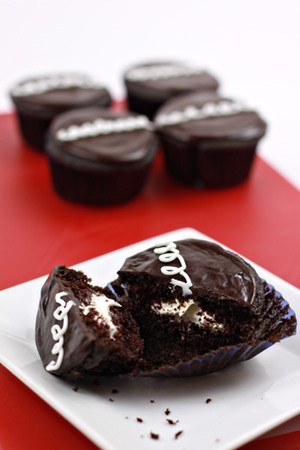 "...a modified version of Zoe's favorite Devil's Food Cupcakes. They are soft and airy, and the coffee really brings the chocolate deeper, perfect for filling with cream. The most worrisome part for me was the filling, and my husband said it was right on. I have Bridget to thank for that one. I modeled it after her own cupcake filling along with the icing. The ganache is simply my favorite recipe, adjusted to a smaller portion size."